Jim Solomon of S.C.O.R.E. 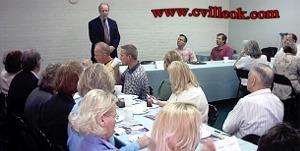 (Service Corps of Retired Executives: Counselors to America Small Businesses) was the speaker at the Chambers May 6th meeting held at the Bank of the Lakes Community Room. His group offers free advice to start up businesses, businesses wanting to expand, or companies in trouble. A good business plan is highest on their list of 'musts' for any business. This chapter of S.C.O.R.E. is based in Tulsa and also hold seminars monthly at Hardesty Library there. Debra Middleton (of Debra's Books & More) was already dressed to promote the May 15th display of military vehicles in front of her store for Armed Forces Day. 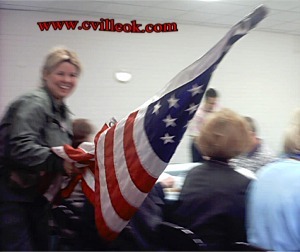 When the Pledge of Allegiance was almost skipped due to lack of a flag, Debra left and returned with a flag so the meeting could get off to a proper patriotic start. Krista Oslin, owner of Promotions, Etc., will be chairman of the Chamber's 2004 Founders Day Celebration (Sept 11).